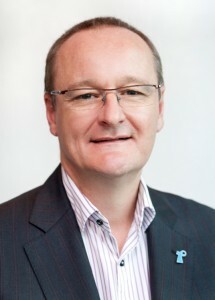 Associate Professor Anthony Lowe is head of the Prostate Cancer Foundation of Australia (PCFA), the peak national body for prostate cancer, providing and advocating for resources and support for affected men, their families and health professionals, raising awareness and funding important, world-class research into the cause, diagnosis, treatment and prevention of prostate cancer. Prior to joining PCFA, Dr Lowe was COO and Company Secretary at the National Breast Cancer Foundation and previously held international senior executive positions in the financial services industry. Associate Professor Ganesh Raj is a highly regarded prostate cancer surgeon, with experience in minimally invasive approaches and clinical trials. His basic science research is focused on translational strategies against the androgen receptor, the critical driver of prostate cancer, and in particular understanding interactions between the androgen receptor and various protein cofactors involved in androgen receptor function. His laboratory has recently developed a new class of therapeutic agents (called peptidomimetics) targeting protein-protein interactions (Ravindranathan et al., Nature Communications 2013) offering new hope for men with aggressive disease. PLEASE NOTE: Immediately following the Seminar, the South Australian Breast Cancer Study Group will be hosting a presentation from Dr Jason Carroll, PhD, Senior Group Leader at the Cambridge Institute, Cancer Research UK, University of Cambridge. Dr Carroll, is an Australian researcher who initially trained at the Garvan Institute in Sydney under Professor Robert Sutherland. 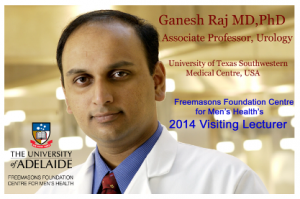 At the 36th Annual San Antonio Breast Cancer Symposium in December 2013, he received the AACR Outstanding Investigator Award for Breast Cancer Research, funded by Susan G. Komen®. Seminar attendees are welcome to stay on to listen to Dr Carroll speak on “Contemporary insights into estrogen action in breast cancer”. This entry was posted in Events and tagged drugs, education, national guidelines, prostate cancer, research. Bookmark the permalink.